A feminist breast cancer memoir of medical trauma, love, and how she found the strength to listen to her body. She was wrong. In one horrifying moment after another, everything that could go wrong does—the surgeon gives her a double mastectomy but misses the cancerous lump, one of the most effective drug treatments fails, and a doctor's error may have unleashed millions of breast cancer cells into her body. Catherine Guthrie is a women's health journalist. For the past twenty years, her reporting, essays, and criticism have appeared in dozens of national magazines including Time; O, The Oprah Magazine, Slate; Prevention; and Yoga Journal. She is a two-time survivor of breast cancer. She lives near Boston, Massachusetts. "Catherine Guthrie’s memoir Flat is a smart and beautifully written story that takes the reader on a journey through the land of the healthy and the sick as she faces breast cancer. As this young woman bobs around in a sea of medical uncertainty, she eventually reclaims her body, her life, and her sense of self. Despite Guthrie’s distaste for the word survivor, hers is as much a story about surviving breast cancer as it is about surviving culture and womanhood itself." "With honesty and a touch of humor, the author . . . [traces] the many contours of her struggles, from her diagnosis to double mastectomy to her decision about reconstructive surgery. She details the horror at having the actual lump missed during surgery, her anger at the surgeon, and how her drug treatment failed her as well. She shares the fears, disappointments, and confusion she felt, despite her knowledge about this particular form of cancer, and how she eventually embraced her new body. She includes touching moments with her partner and how, together, they navigated the often confusing medical world and the transition from healthy to sick and back. In a world where 1 in 8 women will be diagnosed with breast cancer, Guthrie's memoir is useful, instructive reading for anyone entering this sisterhood or caretaking a friend or family member with this disease. Filled with great openness and sincerity, the book adds an original and colorful layer to the pink-ribbon world of breast cancer." "This isn’t only a story of diagnosis, treatment, medical mistakes, and complications told within the impossibility of a neat or final resolution. It is also the complex, honest, and tender rendering of how breast cancer changes her understanding of her own body, her relationship with her beloved Mary, and even the style and content of what she is able to write in her career as a women’s health journalist. . . . With clarity, specificity, and keen narrative skills, Guthrie tells the story of how she regains that sense of ease in her body and finds joy once again in her relationships with her beloved, her career, and her community of friends." 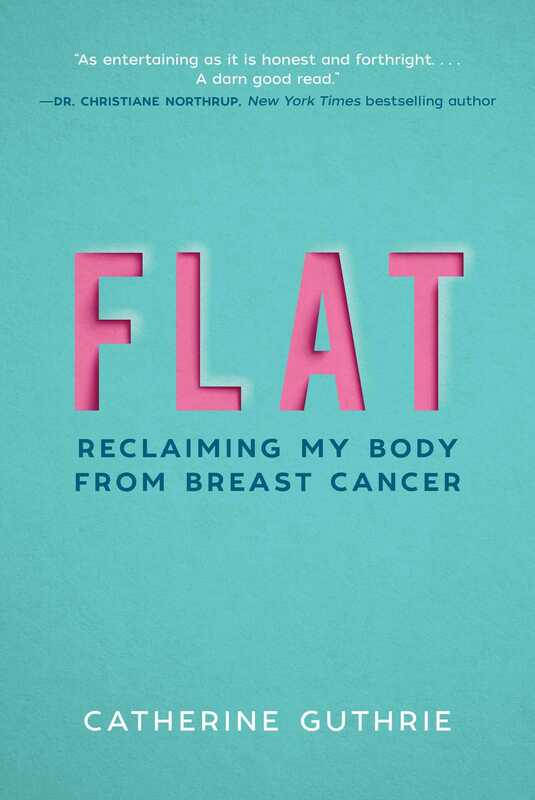 “Flat is a captivating story that will appeal to any intelligent reader forced to deal with the unexpected havoc wreaked by a breast cancer diagnosis. I highly recommend Flat to any woman and her loved ones looking to move through the tumult of cancer."